Fortunate had been the music lovers the world over, and especially my fellow Indians, for this day in history which witnessed the birth of one of the greatest singers in Indian Film Industry, Kishore Kumar aka Abhas Kumar Ganguly. A genius is born, and not made. And how true is this saying when it comes to him. Even though he had no formal education in music, acting or film production, which one would associate as a must for any talent to be harnessed, he was an epitome in virtually every bit if art he touched, be it singing or acting. Never had the industry seen such a versatile genius and perhaps would never see. Starting with a humble beginning as a chorus singer in 1940s, he went on to become the numero uno singer of the Indian cinema by 1970s. During this journey to stardom of three decades, he grew from strength to strength and unfolded his multitude of talent and artistic skills. 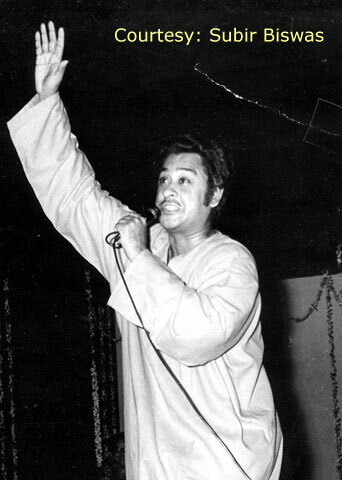 During the course, he sang lighter, comedy type songs like Kuyen Mein Kood Kar Mar Jana from Parivar, to soft melodies like Ye Duniawale Poochenge from Mahal, to heart rendering songs like Koi Hamdam Na Raha from Door Ka Rahi, to classical songs like Husn Bhi Udaas Hai from Fareb, to soothing silken touch songs like Ye Jeevan Hai Is Jeevan Ka from Piya Ka Ghar with equal ease and aplomb. 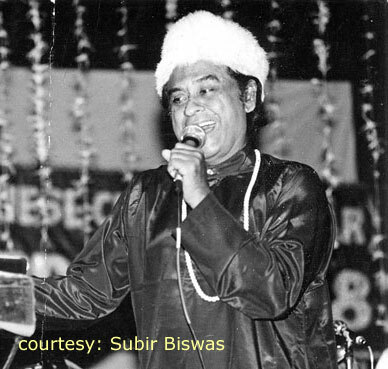 His reverberating baritone and pristine voice always infused such life to his songs that even Aurangazeb would have been tempted to hum his songs. Old and young alike, his voice touched people at their heart that even to this day, after two decades of his death, he remains one of the most popular singer even amongst the current youth which never had the fortune of being contemporary to his singing life. But Kishore Kumar was not only all about singing. He started his acting career in 1946 in the film Shikari.. How coincidental that this film in 1946 was also to be the debut film for another legend of Indian film music, SD Burman. Acting was never something which Kishore Kumar liked very much. It was just at the instance of his by then famous actor brother, Ashok Kumar that he took to acting. Despite being a reluctant actor, he would go on to become the leading Superstar hero of bollywood by the turn of 1950s only speaks of a genius of art that he was. His first experience of producing a film was in 1958 with the film Chalti Ka Naaam Gaadi, a movie remembered to date as one of the best comedy films ever made in Bollywood. He penned his first song for film Jhumroo in 1961, Main Hoon Jhum Jhum Jhumroo, which remains as the epitome of yodeling abilities even after half a century. Through his first two music compositions for films Jhumroo and Door Gagan Ki Chhan Mein, he unleashed his breadth of music comprehension and feel, spanning from fast, pacey, rap like music from Jhumroo to soft, soothing and mesmerizing music of Door Gagan Ki Chhaon Mein. Kishore Kumar was someone extra-ordinary. He was gifted and perhaps ahead of his times. He was willing to explore horizons most would dread to tread, especially in the earlier part of his Bollywood life. As he grew in stature and popularity, he introduced the industry with newer paradigms of singing and acting. “Towering genius disdains a beaten path. It seeks regions hitherto unexplored.” If these remarks of Abraham Lincoln suited anyone the best, Kishore Kumar would be the one. This entry was posted on Saturday, August 4th, 2007 at 9:00 am	and is filed under Specials. You can follow any responses to this entry through the RSS 2.0 feed. You can skip to the end and leave a response. Pinging is currently not allowed. Guru still lives with us in his voice. I am reproducing my post on the said thread here for the readers of this site…may be some of us would see our heros in different light altogether…Here is the reproduction…. Thanks a lot Eskayes for this beautiful article….Though I peronally think that no epic will be sufficient to express our love and respect to GURU. Special thanks to you Subir for those lovely pictures which adorn this write-up. I fully agree with you that words could never be adequate to express our love and respect to Guru. choti si ye duniya pehchane raste hai tum kanhi to miloge kabhi to miloge to puchenge haal. I have lot of Kishorekumars photos, but i want to contribute to the website. I have the book “The Method of Madness” by Derek Bose. so good photos of his with everyone. i will post if get the chance. Do any one have complete list of Kishor’s Bengali film songs? 7. In who’s lip or in background. Every year, on 13th October, I feel myself filled with sadness when I think of this cruel day when Kishoreda was taken away from us. The loss was irreperable and for good. Never again will there be another Kishore Kumar. Nobody can hope to sing like him. I pay my heartfelt tribute to this genius on this day. Year after year, until I die. Kishoreda, you live within us forever. Every year on this day13 of october ,i ;m so sad for this great man i ask myself why he had to die .the love that i have for you and the respect is still there for you and will always be there,in our heart;s you still livesefor us and you will alway;s be in our heartand mind till our dying day . Oct 13 evening the day when the great Kishore left the physical wold. But his voice will remain eternal till time memorial, and till generations pass on the word. I am thrilled how my younger bro and siters rejoice at his remixed versions, when they have no lue about the great voice. I think after Elvis, its Kishoreda who has made a difference. Singers in India/Pakistan have risen to great heights by just cloning him. He has been a source of bread earners, a soother and a relaxer for many in life and death. Long live the great Kishore. i want some Golden songs of kishor da. 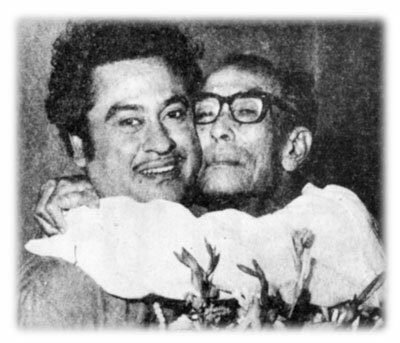 kishor da is a great singer.i miss so him.i want some golden song of kishor da. think after Elvis, its Kishoreda who has made a difference. My brother and I seriously need to thank you, this was very good to read! My greatest idol through my entire life. He will remain my idol even after my death. “LONG LIVE LEGEND”.